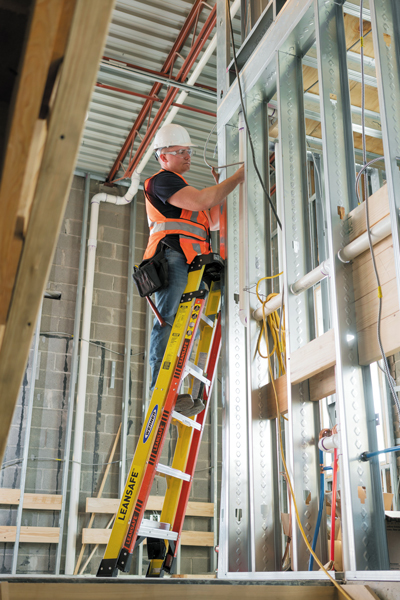 An electrician does his work with assistance from one of Werner’s L7300 series stepladders. The company got its start in the ladder-making business but has since branched out to make a variety of job-site products. Ten years ago, Werner Co., a Pennsylvania-based, privately held manufacturer of ladders, was a $300 million company, with nearly all its sales in the US. Today, it’s one of the world’s leading producers of all types of climbing and access equipment, with a diversified product line that includes secure-storage and safety products and light-duty construction and logistics equipment, and its annual sales total about $1.2 billion. Geoffrey R. Hartenstein, general counsel, has played an important role in making that impressive expansion possible. He and his team have worked to ensure Werner’s compliance in the more than a hundred countries in which it now sells its products, and to make the work easier, they’ve also worked to better integrate their outside counsel and integrate themselves into other aspects of the business. The Werner family still ran the business then, but in 1997, it sold it to an investment firm in New York. In 2006, the company went through bankruptcy, and five hedge funds bought its assets and formed a new company in 2007, naming Hartenstein as general counsel. “That’s when all the international growth and diversification really took off,” he says. The company, which was sold again in 2017, to a German equity firm, now generates about a third of its sales overseas. A similar percentage of its sales comes from nonaccess equipment. “We transitioned the company away from only selling ladders and being reliant on the major home centers—like Home Depot and Lowe’s—to something worldwide,” Hartenstein says. Some of that expansion came from acquisitions in the UK, France, Germany, and other markets. The company also launched its products in China, Canada, and Australia, among other locales. Working overseas also means keeping up with other regional business concerns. Data protection, for example, is more important in Europe than in the US, according to Hartenstein. “We have had to adjust our policies to meet their regulations,” he says. Laws regarding corruption and the sourcing and procurement of workers also are different overseas, and Hartenstein counts on outside counsel for these issues. “Our Chinese counsel has been with us for ten years or so,” he says.